Akshdeep Nath is an Indian cricketer born on 10th May 1993 in Lucknow, Uttar Pradesh. Nath is primarily a right-handed middle order batsman but has bowled right-arm medium fast occasionally. 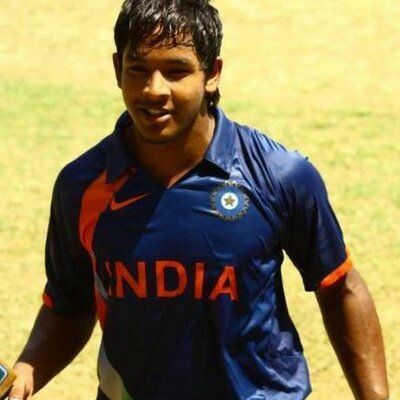 Nath was vice-captain to Unmukt Chand in the team which won the ICC U19 Cricket World Cup in 2012. Akshdeep Nath has always been a technically correct batsman who has risen through the levels of Uttar Pradesh cricket. He started playing cricket from the age of six. A successful Vinoo Mankad Trophy in the 2011-12 season where he led Uttar Pradesh to silverware resulted in him being selected for the ICC U19 World Cup squad to be held in Australia and later elected as the vice-captain. He finished the Vinoo Mankad Trophy as the second highest run scorer and scored five half centuries in the tournament including 88 in the final against Madhya Pradesh. Nath had a poor U19 World Cup on a personal note as he managed only 46 runs in five innings. He took a single wicket in the tournament. Later on, in the 2011-12 Cooch Behar Trophy, Nath showcased his potential with three fifties and a single century as he led the Uttar Pradesh team to the semi-finals. Nath was bought by the new Indian Premier League (IPL) franchise Gujarat Lions in 2016 for his base price of Rs 10 lakhs. Nath made his IPL debut against Rising Pune Supergiants at Rajkot on 6th March 2016. He neither got a chance to bat nor to bowl. In the next match against Mumbai Indians at the Wankhede Stadium, Nath scored 12 runs off 11 balls as his side won by 3 wickets. He was retained in the side for the next couple of games but was dropped after getting only meagre returns from those games. Altogether, he made 20 runs in four games during his debut IPL season. Akshdeep Naths' rise to glory has been very recent and has become a vital cog in the Uttar Pradesh team. He scored 110 against Delhi during the 2017-18 Ranji Trophy to hand his side a vital first innings lead. The knock enabled Nath to establish himself in the UP team as he had been in and out of the side quite frequently. In a Syed Mushtaq Ali T20 Super League game against Bengal at Kolkata, Nath complimented Suresh Raina’s century by scoring 80 off 43 balls himself. The in-form Nath would be handed the reigns of captaincy during the ongoing Vijay Hazare Trophy and shouldered his new responsibility by scoring 54 off 49 balls against Delhi. Unfortunately, the knock was in a losing cause. Nath made his first-class debut in the Ranji Trophy in 2012 when he aspired for greater things. But he has not delivered according to expectations as he had played only six games in his first five seasons. After playing for the Gujarat Lions for two seasons, Nath put up his name for the 2018 Indian Premier League auction and set his base price at Rs 20 lakhs. He was bought by the Kings XI Punjab for Rs 1 crore.